EU Prophecy News: Is a Eurozone Federation Inevitable? Is a Eurozone Federation Inevitable? France Calls for "Eurozone Government"
This week, the President of France has called for a "Eurozone government," at least twice. He plans to push forward specific proposals in the coming months. This Eurozone parliament would include a "specific budget" a "parliament" for democratic control, and a full time President. It will also include proposals for tax harmonization. Hollande said that the lack of unity was harming the Euro project, and they need to push forward to more unity. 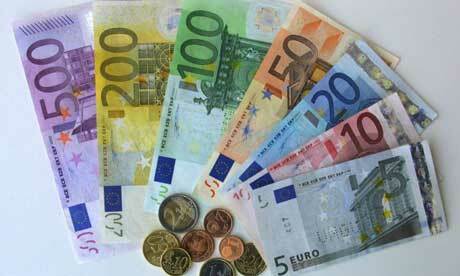 He reiterated his call today (July 19) during the birthday commemoration of Jacques Delors, who founded the Euro. Unsurprisingly, Delors agrees with this plan. Hollande is interested in working with Germany, as well as forming a "vanguard" of countries who are ready to move forward with the plan. Surprisingly, David Cameron likely supports further Eurozone integration, because it sets a precedent for a "two speed" Europe, where he can opt to be on the second tier. Germany is the biggest road block to this plan. Ironically, Wolfgang Schauble, who lobbied hard against Greece on the July 13 EUCO, himself wants a Eurozone finance minister and Eurozone parliament. He is also an old school federalist.. Federalism inevitably involves financial transfers from the strong nations to the weak ones. So this could get interesting. In Solana's report, he states that he wants to build a "European Defence Union" in the same way a "Economic and Monetary Union" was built. After all...he claims....the Euro crisis is getting better*. So we must work on other priorities, such as defence integration, due to the threats surrounding Europe. So Solana's vision seems to be a military pole to the EU, and an economic pole to the EU. Funny thing is, the Bible seems to agree. Revelation 13 talks about two beasts, one from the sea and one from the earth. The sea beast in Revelation 13 is extraordinarily similar to the sea beast of Daniel 7, who many commentators agree is talking about the same dictator/and his corresponding political structure. Later on in Revelation, it talks of the "beast" and the "false prophet" as if they are individuals who are thrown into the Lake of Fire. But of course, these two are heads of different aspects of the same political system. Since the Revelation 13 beast is the revived Roman Empire/its leader, we know that this revived Roman Empire eventually expands its tentacles to the entire world, at least at the height of its power. However, the Antichrist will have trouble holding his empire together, as it will be very prone to fragmentation. The Antichrist in Daniel, as well as in Revelation, is depicted as a military ruler. Revelation mostly describes his political power, but hints at the beasts previous military victories. The book of Daniel provides more details of the Antichrist's military conquests and personality. Notice, this is a giant, global monetary union. Its very intriguing that the Bible focuses on the monetary aspect, and not necessarily fiscal (though surely, the False Prophet will control that as well). Which is weird in and of itself, because that is how the EU operates today. In summary, it is fair to say that the Bible describes the Antichrist (among other things) as a military ruler. And the False Prophet (among other things) as a monetary/economic ruler. These two poles of European integration, military and economic, should be watched very closely. Is the Antichrist Already Active? This website promulgates a theory that many of the prophecies associated with the Antichrist have actually already been fulfilled in Javier Solana. These prophecies relate to a ten nation military alliance in Europe, a man with a weak political position rising up among those ten, those ten giving their political authority to him, and finally his subduing of a triumvirate of three of those ten leaders. (See Daniel 7) On top of all this, this same man is one of the primary architects of a contract between the EU and Israel which is now specifically confirmed for 7 years through the European Neighborhood Policy. Despite a long absence from politics, and his relative old age, the Solana Antichrist theory looked like a bust. But he is kind of in the process of making a come back, promising to devote all of his remaining energy to "European defence integration." He did this by making specific policy recommendations to the European Council via a reputable think tank. He suggested making an integrated military force under a common command structure for the EU. This has been referred to as the "EU army" by others. He has been going on tour advocating this throughout Europe, and a few more presentations are due to be presented. These fulfilled prophecies of course represent the basis of the general theory many have been following for some time now. As far as "evidence" we are in the end times, I would say this does the best anyone has ever seen. After all, many pastors and Bible teachers already thought the EU was the revived Roman Empire. So these are rather incredible developments. However, we mustn't forget the other pole of European integration, which corresponds to the other beast. The Bible is clear that the revived Roman Empire will be a very "divided" kingdom. This exactly describes the Eurozone troubles of the last 5 years. The EU is a heterogenous mixture of different ethnic groups and countries. Some of those countries are stronger than others. However, the kingdom is very divided. As we can see now, even back in 2012, investors were actually concerned the entire thing could break up. Even now, a lack of unity characterizes the EU's activities, as many analysts and articles will readily admit. Ironically, this division and weakness is becoming fairly oppressive in nature. The Eurozone crisis is somewhat difficult to understand, and I have not understood it for some time now (I still don't fully understand it). But this article below is the best explanation I have seen so far. It is biased against the Euro, but is interestingly edited by a liberal American writer. If you are interested, have a look below. But if you don't want to wade through it, I will briefly summarize it and add other information as well. After the financial crisis of 2008, the U.S. and European nations tried to spend their way out of recession. For better or for worse, this is the standard economic advice given on how to escape a recession. However, the U.S. got a little better after a while, whereas the Eurozone started getting worse again. Investors were initially excited about the Euro, and lent money to all EU nations at really cheap rates, since they were all on the Euro. However, this bubble eventually burst. This causes lots of economic pain and debt. Normally, when a country starts to have a crisis like this, they can devalue the currency, which encourages exports and tourism. However, this is where the Eurozone is different. Once recession or financial trouble hits, people lose jobs. However, Spain, Italy, Greece, etc. do not have the option of devaluing their currency. So when all of the foreign money leaves and people lose their jobs...they just stay unemployed. Their is no boost in exports or tourism to fill in the pain to help recover, because the currency remains too expensive. Not to mention...they are still in debt and have to pay it all back. Usually in a federal system, some money is shuffled around from the stronger states to the weaker ones, to even things out. Furthermore, the whole area is mutually in debt, not the individual states. Also, people in the weak economies can just get up and move to a better state. I did not know this until recently, but this is how the U.S. works (and evidently, also Canada). After all, the states don't have different currencies they can devalue to encourage tourism. As a result, the federation has to just give them the money. However, the Eurozone is not a federal state. As a result, the fiscal transfers are politically charged bailouts that require intense negotiations and really harsh terms. Furthermore, in the Eurozone, some of the austerity measures are so harsh that they are counterproductive in getting the country to pay back its debt, since the economy shrinks so much. This results in losses of sovereignty for smaller nations, who cannot pay back their debt and cannot recover because they are on a really expensive currency. And moving out of the bad areas is hard, because they may not know the language of a new place they move to. However, one solution is off of the table. It is clear the leaders of the Eurozone countries are determined that it never breaks up. So we are left with only two alternatives. The EU creates a "United States of Europe"
"United States of Europe" might leave more fiscal autonomy for the member countries. But the "same old same old" would eventually become a very oppressive system where Brussels could control every detail of the nations budget in the weaker economies. The point is, either one of these options is going to gradually move towards a loss of sovereignty for the member nations. The euro’s founding fathers foresaw this problem, but they believed that the necessity for political cooperation generated by the euro would be used by member states to move gradually towards political union. This was Helmut Kohl’s dream. Instead, these pressures were ignored by nations clinging to illusions of sovereignty until they broke free in the euro crisis, unleashing their full destructive potential. Germany recently declassified some documents that admitted to knowing the Euro had flaws (especially because of Italy), but they went ahead with it anyway. It is clear that the French President, and major political parties in France, are ready for federation. However, the EU has long had the "Franco-German" motor. After all, Recommendation 666 was based on a Franco-German proposal itself. One person on Twitter said "can you remember anytime a Franco-German proposal failed?" So if the French can get the Germans to cooperate, it will only be a matter of time until we have a eurozone federation on our hands. But getting cooperation will be tough. Which brings us back to defence integration. If the EU controls the budget, its going to be a lot easier to provide incentives/budgetary controls based on defence spending and defence integration. Unfortunately, this is what the U.S. does. Theoretically, the individual states control their own education systems. But the federal government rewards states with money when they follow their recommendations. So in reality, the US federal government controls education, even though it is outside the area they are supposed to control. The EU could do something similar in defence, if it became a Eurozone federation. I think they are even already talking about small financial incentives for certain types of defence integration, even under the current system. At some point, this is going to get so insane that the whole world will be forced to be on the same currency, through the mark of the beast. It is anyone's guess why it will seem like a good idea at the time. But most likely, it will be a bad economic idea that is politically motivated, just like the Euro is. This will be led by a person who acts on behalf of the Antichrist, controlling the religious and economic aspects. We should keep a very close eye on Javier Solana. But we should also keep a very close eye on "economic integration." They already have the technology for the mark of the beast. The Verichip company formerly implanted chips into peoples arms so they can use them like a credit card. If the battery were to leak, it would cause a painful sore. Manufacturing is now discontinued, but the tech is still there. Needless to say, the chip generated a ton of controversy. All of this sounds terribly familiar from the book of Revelation. Remember the greatest cleverness is to conceal one's cleverness. Is Solana involved? Is he a master of intrigue and getting his way while being in the background? Will he some day emerge? "Remember the greatest cleverness is to conceal one's cleverness." that is why the Bible says antic-christ will be------revealed right? the humble, hugging, ole veteran is very crafty this way ;) and very good at getting others to do his bidding. he has gotten the ball rolling in these many facets of getting globalism mainstream. when it comes to the heavy lifting though, i believe he is your man (behind those closed doors). do i believe is he the ac??? in a word-yes. if not, he has been and is, the most able to set up and guide that one to the position. in my mind i see him as "author and finisher" in that evil parallel. so......i have to be careful here not to totally believe my current "yes" and, of course, wisdom would say "be patient" so we have to stay tuned to see if that is actually true....not to worry---the wait won't be long. gracious he is, good he is not. his presence can almost be felt in these "all things global" affairs. i smell a rat. the same rat for a long time now. thanks david for staying the course. this plot has only thickened, the more crooked and twisted the path has become. how many back doors are there??? what a maze!!! but solana is the mainstay in the thick of it all, or at the very least, nearby in every twist and turn this has taken. evil is greatly served in this man's endeavors. Rouhani and I met in 2003 .I had seen how Rouhani was determined to reach an agreement. And naturally when Rouhani succeeded Ahmadinejad in 2013, a door opened. It is useful to consider whether the cooperation between the permanent members of the Security Council and the EU can advance other issues.The historic agreement with Iran is not an agreement among many others, all needed to bring peace and stability in the Middle East. We just spent the first hurdle. We have now to finish the race. My comment: Solana has the respect of Iran and was instrumental in the background getting the Iran nuclear deal completed. Please note he sees it as part of the push to get peace in the middle east and it is his proposal from a 2009 speech in Ipswitch England that is being presented by the French Foreign to the UN security council calling for a UN security council enforcement of an upcoming "peace deal". In the meantime Solana is traveling Europe working to get the EU military more unified. Check out Jim Rickards comments that the EU knew and expected the current crisis which would allow them to unite the fiscal policies of Europe. They went ahead with Monetary Union knowing full well the day would come when a crisis would allow them to unify the fiscal policies. Is Greece a horn which is in the process of being uprooted? actually i believe they are all still in solana's pocket. his influence is still extremely wide and deep. that is why he keeps the road hot going to confer with all those on varying fronts. this is not a retired gentleman at all. david's post with a picture a while back of mogherini getting his notations (no doubt for talking points) handed to her tells me he keeps checking in on "progress". he is still a rat in my eyes--not to be trusted at all. read a piece he wrote fairly recently for project syndicate that was weighing in on syria. i wonder how often mogherini calls and makes contact with him for advice? my bet is often. he is like proud papa and his child learning to ride with training wheels about to come off--he will be right there. if he isn't the ac he is certainly the groomer for who is. mogherini will be in over her head pretty i think and somebody will take charge is what i bet will happen, but if i'm wrong i'm wrong. i'd rather be watching and wrong than wrong because i wasn't watching in the first place.